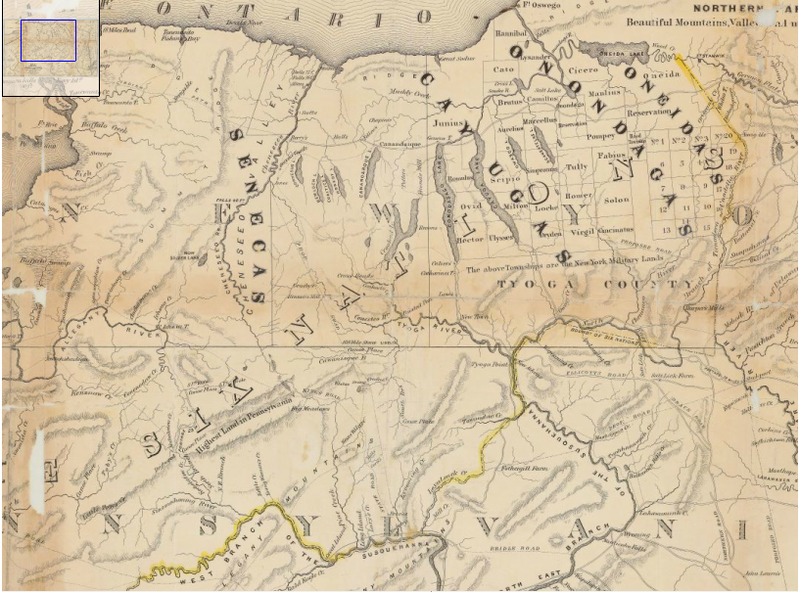 Map Source: New York State Archives, A0448-79, Recorded Indian treaties and deeds, 1703-1871 (bulk 1748-1871). Vol. 1, p. 45. This early map of NY from 1793-1794 shows the Six Nations borders, marked in yellow, as well as Indian paths, mountains, waterways, roads, place names and drainage. Note on map says “Boundary of the Six Nations is taken from an Old Map in Doc. History.” See Johnson’s Map (torn) Hist. Vol. This image shows only part of this map. Online, the map is high quality and sections are enlargeable. This entry was posted in New York, Six Nations. Bookmark the permalink.